Working on your core: Many martial-arts styles focus on strikes, which take a lot of power from your core and upper body. Karate is a popular variety that emphasizes these skills, making it a great core workout that can also tone your arms, back and shoulders. 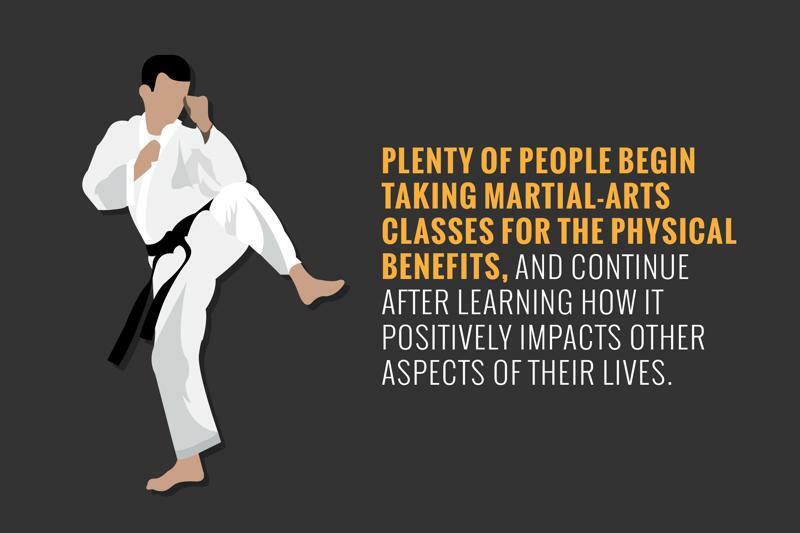 Though karate isn’t a full aerobic workout, it has its place in a fitness and martial-arts routine. Make martial arts your cardio: When it comes to fitness, cardio is an aspect that you can’t leave out. Luckily, there are plenty of martial arts that’ll really get your heart pumping. A few of these include kickboxing, muay Thai and kung fu. These styles of martial arts focus less on power and more on the movement itself. You’ll likely find that your legs will feel strong after a few practices that consist of jumps and kicks. Prepare yourself: Just like you wouldn’t begin running on the treadmill without stretching first, you don’t want to start your martial-arts practice without preparing your body. Not only does stretching help your joints and muscles loosen up for the upcoming practice, but making sure you relax those muscles lowers your risk of strains. If you still end up straining a muscle during your practice, take a few days off to rest and ice the injured muscle.